A new series from Image Comics and it’s written by Greg Rucka? Yes, please. That’s pretty much how it went, to be honest. I’m a long time fan of Image and the great books they turn out. And as for Rucka…well, duh. It’s Greg freaking Rucka! Geez, like you needed to ask. I am super stoked to be able to introduce you to Lazarus #1. We’ve been hearing a lot about it for a few months now and it’s finally out this week! So read on, my friends. Read on. This is the story of a young woman named Forever. She exists in a world where turmoil and war have turned the world into a financial battleground. Discarding politics and geographic lines, the ruling families hold immense power based on money and fear. If you can show usefulness then you and yours are provided for, if you serve no purpose then you are Waste. Each family puts all their resources, training and tech into one person who is outfitted and trained to defend the family in this hostile environment. Because of the near supernatural abilities they attain, these individuals are referred to as the family’s Lazarus. And for the Carlyle family, that person is Forever. Death is an inconvenience, at least that’s how Forever sees it. Resurrection seems farfetched to us but in this world where technology has taken a leap forward, it’s very real. Dispatching enemies of the family is ingrained in her being, violence and death are just part of who she is. Or are they? Plagued by doubt and emotions that should have long since been terminated from her being, our heroine fights a moral battle within herself. Michael Lark takes a heavy hand with the art here. Darker colors are used to reflect the mood of the story, not dismal but more overcast. Like a cloudy day in the summer, you can feel the slight tinge of morbidity that seems to permeate the world of this comic. It really sets the stage for the story here. And speaking of story, Rucka does a wickedly good job of creating a character that is so flawed that you cannot help but feel a connection to her. The set up in this first comic is amazing, so much information is delivered in 24 pages but it never seems rushed. That’s the magic of Rucka. From what I have heard, this is the only new series that Image is starting this month. As such, it’s obviously the prime starting point. If you liked any of the work that these folks have done over the last couple of decades then you are sure to enjoy this. Rucka and Lark made a great team before and they haven’t lost that flair in the years since. 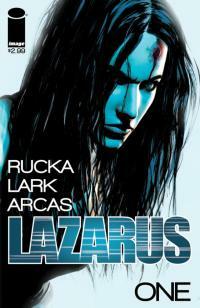 Grab Lazarus when you can, it’s going to be a great series.